The Badger is a great choice of cab to pair with an affordable amp, which will cut the mustard in any situation you can throw at it. And with all the custom options available, it'll feel like your cab, not just another generic black box. A new cab and speakers is an upgrade that many guitarists overlook, despite the fact that it can completely transform your favourite amp. Road Kill Cabs aims to make that transformation as affordable as possible, with a range of colour customisation options also thrown in. 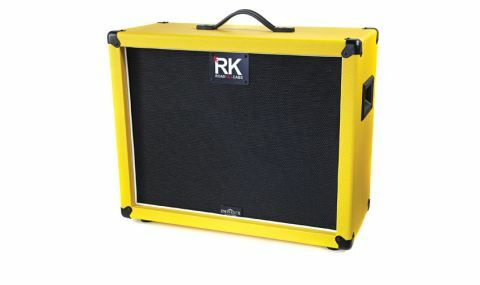 "Crucially, the Badger sounds fantastic, throwing out a full and punchy sound for its size"
All of Road Kill's cabs are named after progressively larger mammals known to meet their end under wheel or over bonnet, with this particular 2x12 known as 'The Badger'. Perhaps not the choice for Greenpeace advocates, then. Regardless, The Badger does seem much better suited to the road than its namesake, constructed from sturdy 12mm birch plywood, with corner protectors and mini side-handles. Measuring in at 630mm across, 500mm high, 280mm deep and weighing just 20kg it's also relatively compact and light compared to its rivals. Crucially, the Badger sounds fantastic, throwing out a full and punchy sound for its size, with the Eminence Private Jacks pumping out a balanced, versatile tone with plenty of mid focus. Governors are an extra tenner, and the full range of Eminence or Celestion speakers is also available. Of course, you can always buy the cab unloaded, reducing the price to a mere £179.